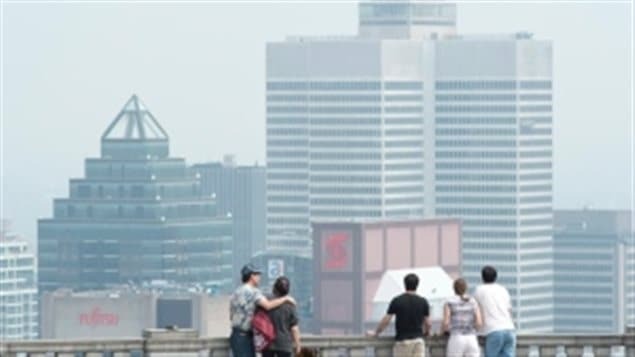 Montreal is seen in a file photo during a smog warning in 2013. A new report suggests that Canadians who live in areas with higher air pollution have an increased risk of dying from conditions like diabetes and heart disease. Surprisingly, researchers did not find any increased risk of dying from respiratory disease. They said they could not explain the findings. The study is the first to show risk estimates associated with the combined exposure to multiple pollutants, such as ozone, nitrogen dioxide and find particles. It used information from the long-form census taken in 1991 and tracked 15 per cent of the Canadian population for 16 years. Results were published in Environmental Health Perspectives. The data shows the risk of dying is about eight per cent higher in places with average levels of pollution than in places with low levels. Researchers said air pollution is just one of many risk factors that can affect life expectancy. For example, while urban areas have higher levels of pollution, there are health benefits if people can walk to their destinations. I got diagnosed with Type 2 Diabetes last year, and was put on Metformin. I followed the ADA diet 100% for a few weeks but it was ineffective at getting my blood sugar below 140. My Doctor was pretty ineffective as far as treatment options went (Metformin until Insulin…). Then I found the Diabetes Destroyer Book created by David Andrews to help you figure out how to beat diabetes naturally, without being dependent on medications. Since following that protocol I’ve lost over 30 pounds and shaved 7 inches off my waist. I have more energy than ever, and can even work out twice on the same day when I feel like it. I hope that more people begin to open their eyes to the dead-end that is depending only on medications for Diabetes – there is a lot of success to be seen trying natural methods.